I love a good denim dress for a couple of reasons. It’s easy and casual, so it makes the perfect piece to wear all day. A denim dress is also a great transition piece for Fall. The muted color means you can add just about anything in fall colors to create a great look. There is so much versatility so it is easy to style in a variety of ways. 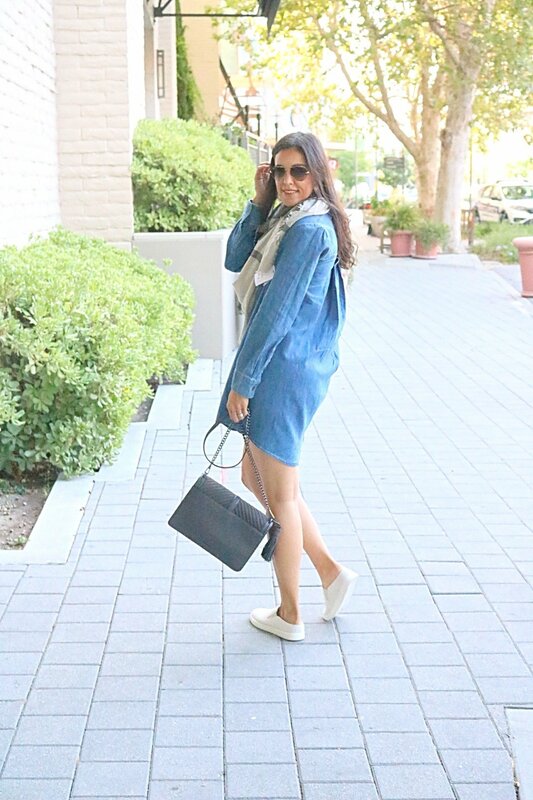 Here are 4 ways to style your denim dress and get the wear out of it. A long cardigan is perfect to layer over it and pair it with riding boots. This makes the perfect daytime look. Meet your girlfriends for lunch, shopping and/or happy hour. Try adding a leather or suede jacket and a pair of mules, flat or heeled. This will give it the perfect amount of edge to wear your denim dress out for date night. A utility jacket with suede booties. Pair it with sneakers or slip-ons. This is my favorite mom-life approved way to wear a denim dress. Each option gives the dress a completely different vibe. I am sure you will see this dress on repeat all fall, but you may not know it’s the same one because mixing up the style makes it look so different. Check out this post for how I styled a denim dress when I pregnant with Amelia. This time I chose to keep this denim swing dress simple with a scarf and sneakers. This is the perfect way to keep the dress casual and comfortable to run around with the kids, completing errands or casual lunch with the hubs. What is your favorite way to wear your denim dress? I’d love to hear your thoughts and style ideas. Thanks so much for stopping by and hope you’re having a great week so far! This is so cute, babe! Great idea layering on the scarf! Denim dress are really perfect for fall. You styled yours really beautifully dear, especially with the scarf.